I am looking to calculate % RSD on System suitability Brackets. I have put labels (RS1, RS2, RS3) on each of the SS injections. I would like to calculate the % RSD of the area of the injections. For example % RSD of the area of RS1 injections and RS2 injections. I am trying to use the Summarize Custom Fields incrementally but i am having issues. I am looking for any assistance that can be provided. Can you expand on your issues and sample set configuration? I presume it is that the function is one row "behind" as it is only considering the rows above it then? Is it effectively overwriting all results above the instruction? How is your sample set configured with the Summarize...incrementally? Is the processing column in the sample set listed as normal for after you've processed the most recent bracket? A screenshot of a sample set would be pretty useful as well as your custom field configuration if you could add those. I am trying to create a incremental % RSD calculation. 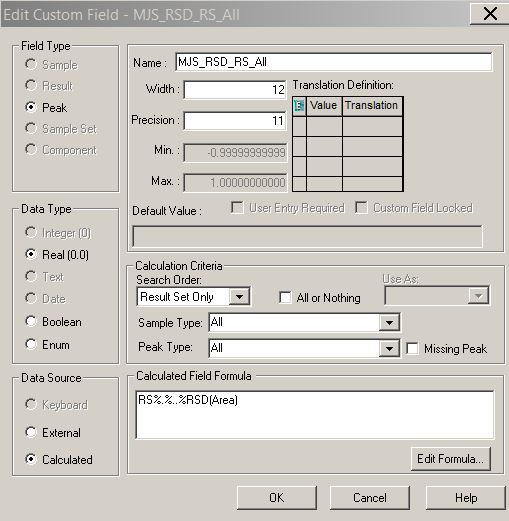 or have Empower calculate the % RSD for bracketing Reference Standard. My sample set and custom field is attached. So, I played with this in a test project and configured everything the way you have it for the field and sample set and all the numbers match up when calculated in Excel. Would you be able to share your area/field results? I've attached screenshots of my configuration(s) and results for comparison. I don't see anything different between our custom fields and sample set (beyond little things that shouldn't matter at least). There has to be something tiny that is getting missed. Its been a while since I set up something like that but it might help to include the labels of the standards that you want summarized in the Label column directly opposite the Summarize custom fields incrementally so for instance for the first increment function add in the first and second standard, the next increment add in the first, second and third standard separated by a space in the Label column. This might instruct Empower on the exact set of standards to use.. 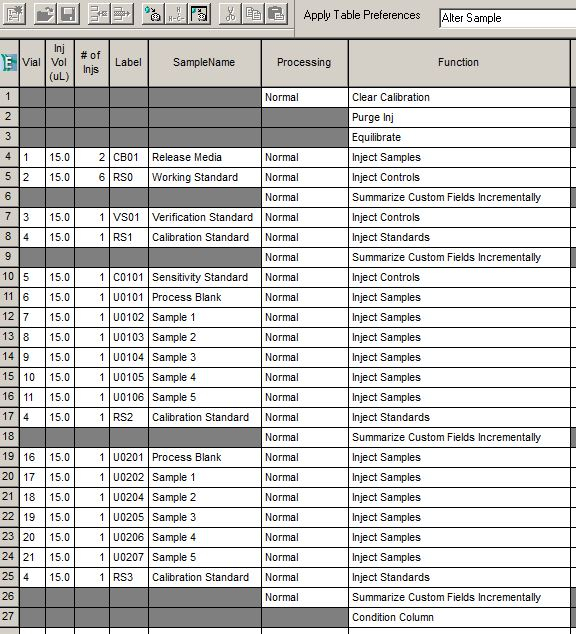 It looks like I included the wrong attachment in the last message...this one is the sample set with labels for what I did...although I didn't capture the label reference column, they were blank as in masters1's sample set. Sorry for the delay in responding back I was stuck in the lab rather than playing in Empower. When I try to put the labels into the Label Reference as I realized i had in fact forgotten to add them. I am getting an error. I would check again closely that you have the exact same labels for both fields and no spaces or lowercase between them. Also, you have your standards down as inject samples, is that deliberate? Check that your sample type in custom field isn't limited to "Unknowns Only". I checked everything and everything matches up. We are trying to stay away from using Inject Standards in methods like this one as we have others that do require standards to generate calibration curves and we do not want to create confusion. Please correct me if i am wrong. In the Label reference column, should it include the label for both sets of brackets. When I try to put more than one Label in there, it gives me the error. I have used multiple Labels before so I am not sure of the issue. Maybe leave out the labes completly. Ive never used any labels next to a summarize custom fields function and always got results. The fact that its incremental should be enough.